Stuffy McInnis was traded to Boston in January 1918 after playing nine seasons with the Philadelphia Athletics. He began the year at third base but was moved to his usual position of first base in mid-May. Batting in the fifth spot in the 1918 Red Sox lineup, McInnis had the worst season of his 19-year career. 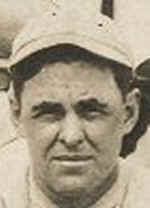 After four years with the Red Sox (1918-21), McInnis played for Cleveland, the Boston Braves, Pittsburgh and the Philadelphia Phillies. In 1927, he was a player-manager for the National League champion Pirates. McInnis set a record for first baseman in 1921 with 1 error in 152 games. With Boston and Cleveland in 1921-22, he handled 1,700 chances without an error. Manager: Salem, New England League, 1928. Minor Leagues: NEL - New England League; Atlantic City not part of organized baseball.